THE RED SEA CONNECTS the MEDITERRANEAN SEA to the INDIAN OCEAN via the Suez Canal. It lies in the Great Rift Valley between Africa and the Arabian Peninsula. EGYPT, SUDAN, ERITREA, and DJIBOUTI border it to the west, while ISRAEL is to the north and JORDAN, YEMEN, and SAUDI ARABIA are the to the east. Scientists believe it was formed 20 million years ago when the Earth’s crust weakened and was torn apart, creating a jagged rift across Africa. Volcanoes erupted on either side, creating volcanic mountains. Water filled this part of the fault, creating the Red Sea. The sea is still widening by about .5 in (12.7 cm) each year. The sea has an area of about 170,000 square mi (440,300 square km). The long, narrow body of water is 1,240 mi (2,000 km) long and measures 185 mi (300 km) at its widest point. The Red Sea is a very deep sea, reaching depths of almost 9,840 ft (3,000 m) in the center. The Red Sea is saltier than any ocean. This is partly due to a high rate of evaporation because of the heat and partly due to low annual rainfall. The water is composed of 3.9 to 4.1 percent salt. 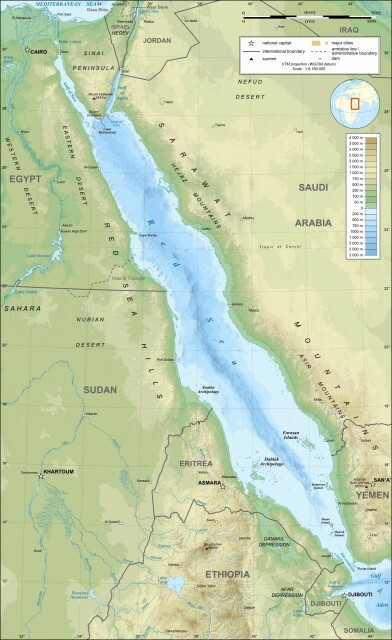 At its northern edge, the Red Sea splits into two gulfs: the GULF OF AQABA to the west and the Gulf of Suez to the east, flanking the Sinai Peninsula. The area has historically served as a departure point for pilgrims traveling to Mecca. Its strategic location made the Red Sea an important trade route in ancient times. During the time of the Roman Empire, trade in spices and other exotic goods flourished between Egypt and INDIA. Other goods included cloth, aromatic woods, incense, coffee, and tea. There was often conflict in the area, as different groups wanted to control the lucrative trade route. The Red Sea’s importance declined when an all-water route around Africa to Europe was discovered in 1498. The Red Sea rose to importance again when the Suez Canal opened in 1869. It provided a more direct connection between Europe and East Asia and AUSTRALIA. The canal was closed for several years after the Arab-Israeli War in 1967. It was reopened and enlarged in 1975 and traffic again increased. Important ports include Jedda, Mukalla, and Suez. Jedda, located in Saudi Arabia, is just 31 mi (50 km) from Mecca and serves as the main port for pilgrims coming by air or by sea. It’s also a commercial center and a center for importing livestock. Jedda has iron and steel plants and oil refineries as well. Mukalla, in Yemen, is located on the Gulf of Aden. It’s the area’s most important port, but monsoons make it impossible to use between June and September. Mukalla’s economy is based on the fishing industry, but boatbuilding is also important. Suez lies at the southern entrance to the canal and has been a commercial port since the seventh century. It was devastated during the Arab-Israeli War, but has managed to recover. Industry includes petrochemical plants as well as cement and fertilizer plants. Fishing is also important to the economy. The Red Sea area has a diversity of flora and fauna. Marine turtles, including green, loggerhead, leatherback, olive ridley, and hawksbill flourish there. A major bird migration route makes the Red Sea a favorite destination for bird-watchers. Here you might see a pink-backed pelican, a brown booby, a whiteeyed gull, or a white-cheeked tern. The Red Sea has become a popular diving and snorkeling destination, because of the variety of marine life beneath the sea. Seventeen species of fish are endemic to the area, meaning they are not found anywhere else. Dugong, beaked whales, white-tip reef sharks, butterfly fish, giant clams, and several species of dolphins can be seen around the coral reefs. A few of the sea creatures are dangerous to divers. Shark attacks in the Red Sea are rare, but other species pose a threat to swimmers. The main danger comes from animals with poisonous stings rather than those that bite. The stonefish and scorpionfish lie on the bottom of the sea, perfectly camouflaged. When stepped on or touched, they sting. Their poison causes swelling and unbearable shooting pains. People have died from the stings. The Red Sea features prominently in the Bible in the book of Exodus. According to the Bible, Moses was leading thousands of formerly enslaved Jews out of Egypt. Pharaoh sent men in 600 chariots to stop them When the Jews came to the Red Sea, they thought they would be recaptured, but Moses stretched out his hand over the sea and the Lord drove the waters back, making a path of dry land where the sea was divided. The Jews escaped across the dry path, but when the Egyptian chariots followed them, the wall of water engulfed them, drowning them all. Scientists have advanced several theories explaining the parting of the sea. One says the coral reef beneath the sea used to be closer to the surface. It hypothesizes that if the wind blew all night, it could drive the water back for half an hour, creating a dry path for the Israelis to cross.